My favorite flower – the bird of paradise, or Strelitzia. There are 5 varieties of the plant, which is native to South Africa. I saw these often, growing up in southern California, and I’m surprised I don’t see them here in Florida. They grow in a large bush, and occasionally I’ve found the cut flowers for sale at Whole Foods. A little unusual, perhaps, in the cut flower world, but I love them. 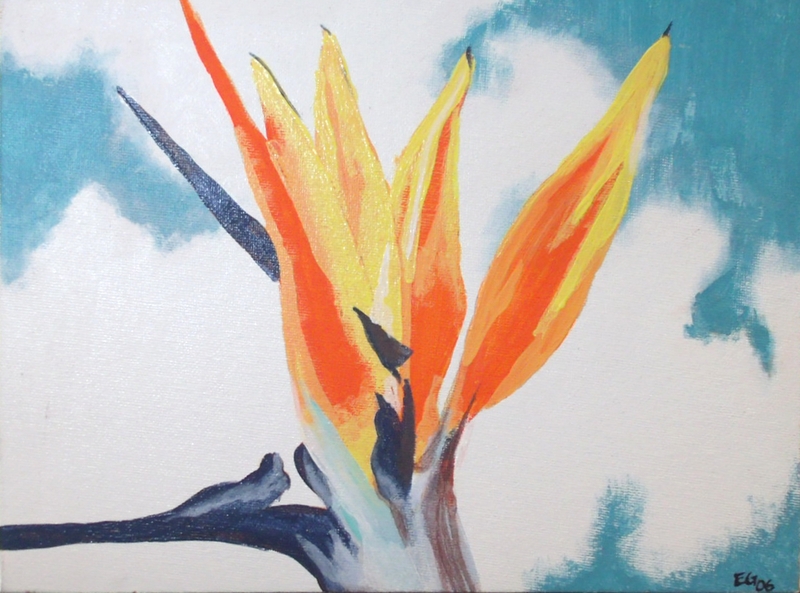 This entry was posted in acrylic, art, bird of paradise, blue, clouds, flower, flowers, for sale, nature, orange, painting, plants, tropical, Uncategorized and tagged acrylic, art, bird of paradise, blue, clouds, flower, flowers, for sale, nature, orange, painting, plants, tropical on June 16, 2013 by Jumping Jack Studios.